The women of boxing are a special breed and deserve the utmost respect and admiration. These courageous women have chosen to put food on the table in a beautiful but brutal way, mentally and physically, for the love of the sport. Adding to that is the ruthlessness women face outside of the ring trying to come up in a game defined by men where fights, money and support are hard to come by. Men in the sport find these things hard to come by so it doesn’t leave much room in the world of pugilism for these pretty paladins. 23-year-old Knight of Chico, CA, is the epitome of what it takes to be a woman boxer as she has gone through the gambit of the misfortunes, sacrifices and adaptations to get to where she stands today. Displaying her dedication for what she does, Ava often makes a three hour trek from Chico to San Francisco to train with Ben Bautista of SFC Boxing. The populous of female fighters aren’t many so women like Ava end up fighting the same opponent many times over. Taking fights on short notice or fighting at weights nowhere near your own is the norm in the cutthroat world of feminine fist-a-cuffs. Knight is a beauty and one of the more popular fighters in the game who is on the cusp of super stardom. She will be challenging for her second world title on Oct. 29th, in Colima, Colima, MEX, at the Pelenque de la Feria when she takes on undefeated Arely “Ametralladora” Mucino (14-0, 8KOs) of Monterrey, Nuevo Leon, MEX, in a 10 round scrap for Mucino’s IBF Flyweight title which she’ll be defending for the fourth time broadcast on Televisa and presented by HG Boxing. It will be one of three championship fights as the main event feature’s 27-year-old Giovanni “El Ruso” Caro (22-9-4, 17KOs) of Mexico City, MEX, taking on Johannesburg, South Africa’s 33-year-old Takalani “Panther” Ndlovu (32-6, 18KOs) in a 12 round contest for the South African’s IBF Super Bantamweight belt.The third title fight has 23-year-old WBO Bantamweight champ Kaliesha “Wild Wild” West (14-1-3, 4KOs) of Moreno Valley, CA, defending her title for the third time in a 10 round tussle against TBA. This star-studded event will coincide with the 74th edition of the Todos Los Santos Fair which the government presents for its people every year presenting a multitude of events with international quality and excellent concerts. 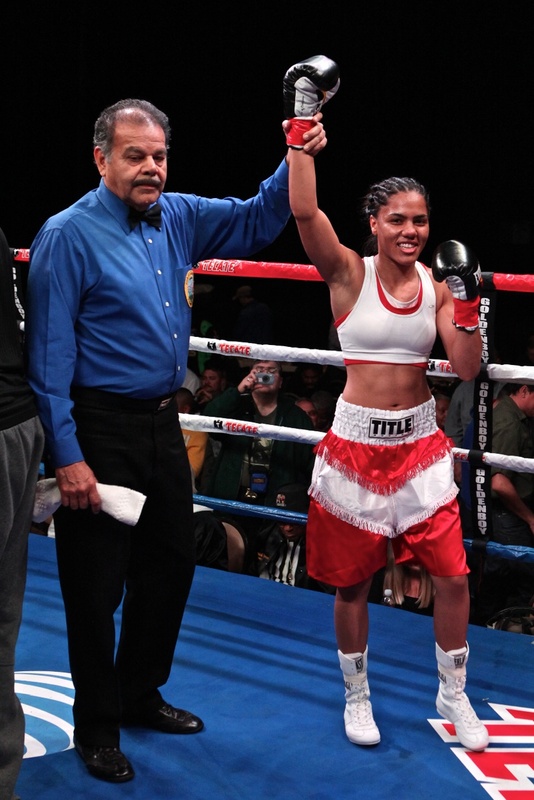 A flyweight silver medalist at the 2006 National Amateur Championships and two-time San Francisco Golden Gloves titlist, Ava Knight’s only loss came in her first title bid against Mexico’s 31-year-old Ana “La Guerrera” Maria Torres (27-3-3, 15KOs) in 2009 for the WBC Super Flyweight championship in Mexico. Ava faced uphill circumstances leading up to the contest like fighting on short notice among other things but at the end of the day, she lost fair and square to a much more experienced and great champion. Knight fought well and made a good account of herself that night in Mexico, coming away enlightened while gaining immeasurable expertise. The fight with Torres was closer than the tallies would lead you to believe and with the improvements made by the “Lady of Boxing” in the last two years, this is a rematch I’d like to see. Ava has three draws on her resume and in each case you could argue victory in her favor. One of those draws came in her last fight, a rematch against another popular Californian puglist in the formerly mentioned WBO Bantamweight champion Kaliesha West. 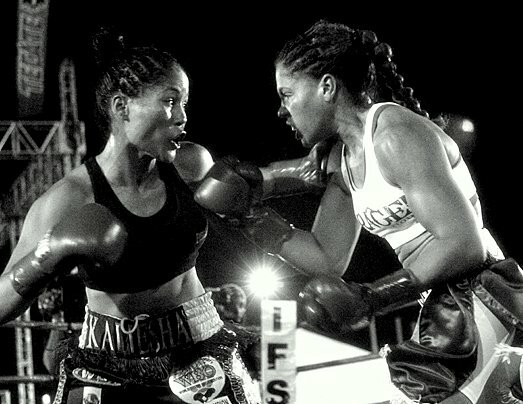 The first time the pair met in 2008, Knight beat West by 8 round unanimous decision for the IFBA North American Bantamweight title, giving West her only loss. Ava felt she repeated that scenario this past June but it wasn’t to be and something tells me Knight will get another chance at “Wild Wild” West to clear the smoke. From the outset of Knights career, she’s played the role of underdog proving the people in the know dead wrong on numerous occasions by pulling of upsets and making the most of her precious opportunities. With her fists, Ava has showed the boxing world that she’s no stepping stone and with a great performance on Oct. 29th, not only will she pick up the IBF Flyweight strap but hopefully the attention of sponsors and a promotional outfit that would enjoy employing a hard working, dedicated and highly skilled boxer on the rise. Knight has a seemingly bright future ahead of her but knows she must win her dream matchup on the 29th in Mexico before she embarks on future mega bouts with the other stars of female boxing. Ava took the time to speak to me over the phone as she prepares for her championship tilt and here is what the affable boxer had to say. Esteban Walters: When did you start boxing and how did you get into the sport? Ava Knight: It was sort of an accident, I was never around boxing as a child and I had never even watched it before. A friend took me to a boxing gym and I used to just mess around, I never took it seriously until I was thirteen. EW: I can only imagine that a woman who chooses boxing as a career does it for the love of the sport as it’s more difficult for females than males in terms of support. Can you talk about that a little, what you go through as a woman in boxing and why you pursue it? AV: I think it’s really hard there are not a lot of women to fight. Sometimes it’s not the boxers but the management that doesn’t want them fighting someone better. I go in there and train just like the men do, everything is the same except I just don’t get treated the same. It’s hard but I just look at the positive side, I’m opening a pathway for the younger girls coming up so that they can have it fair. I might have to go through this difficult stage but as long as it [women's boxing] gets where it’s supposed to be its fine with me. EW: There’s got to be trailblazers! AV: Exactly. It’s a hard road but I find that doing other things in life make me realize that this is what I want to do and I have people around me who support that and keep me going so it’s good. EW: I used to visit Chico in high school and know it’s a small party town. Did it make it harder being from such a small town as far as training, sparring or promotional aspects of the game? AV: Yes being in Chico has been really hard, like traveling as an amateur at least three hours just to get a fight was hard. And training with guys because Chico is so small that finding people who actually want to do a sport like this is hard, so I have sparred guys my entire career. Even to this day, I moved to the Bay area for a year and even some of the girls over there didn’t want to spar me, so it’s kind of ‘lose lose,’ but being in Chico is worse because of where it is. EW: Do you have a regular job or is it just boxing and school and how do you balance them? AV: Right now, since I just moved back to Chico a few months ago, I got a small little boxing class going on. It’s not too bad, I live with my boyfriend and he’s very supportive and wants to see me do what I want to do, so that helps a lot. Preparing for this fight is hard because I’m driving three hours out to the Bay area and back but it’s accepted. I work with Ben Bautista out of SFC in San Francisco. He reached out to me and said, ‘Hey, if you come out here we can train you,’ and at the time I was offered a job out there. I took that opportunity and they brought me in and treated me like family so it’s great. Boxing is a lonely sport and that support really helps. EW: What style of fighter would you say you are and what is your greatest asset or weapon? AV: I have actually heard a lot of different things from different coaches about what style I have. I don’t really think I have a set style because I can change it up. I’ll say I’m a boxer-puncher. If I get in there with someone who wants to box I can try and outbox them or I can go at them and just bang. EW: You have a good resume and I know you felt you won the draws on your record. Your only loss was to Ana Maria Torres for the WBC Super Flyweight title. How did that loss affect you and do you feel you learned anything in that fight that makes you a better fighter today? AV: Yes, that fight was the most important fight I ever had. Not just because it was my only loss but because of the situations that happened with the whole fight. Before the fight I hurt my back but decided that I couldn’t give up the opportunity. So I didn’t train two weeks out before the fight, I did light training but that was it. When I went down there [Mexico] I felt like I was being treated unfairly. Things weren’t told to me and stuff was being done that I didn’t think was necessary. They just put me in these bad conditions and it made me feel like I just didn’t want to be there anymore but after the fight I realized that this is just what people do. They want their people to win and they’ll do anything they can to get it done. They brought me down there just to pay me to leave. I lost all ten rounds, I thought I won at least four of those but the cards came out different. I knew she won though, no argument there. I do want my second chance though, I know it would be a different story because now I know what to expect. EW: You’ve made a name for yourself in boxing and become a popular fighter, especially on the West Coast. There’s another popular Californian in Kaliesha West whom you fought twice. You beat West the first time and drew with her in June. 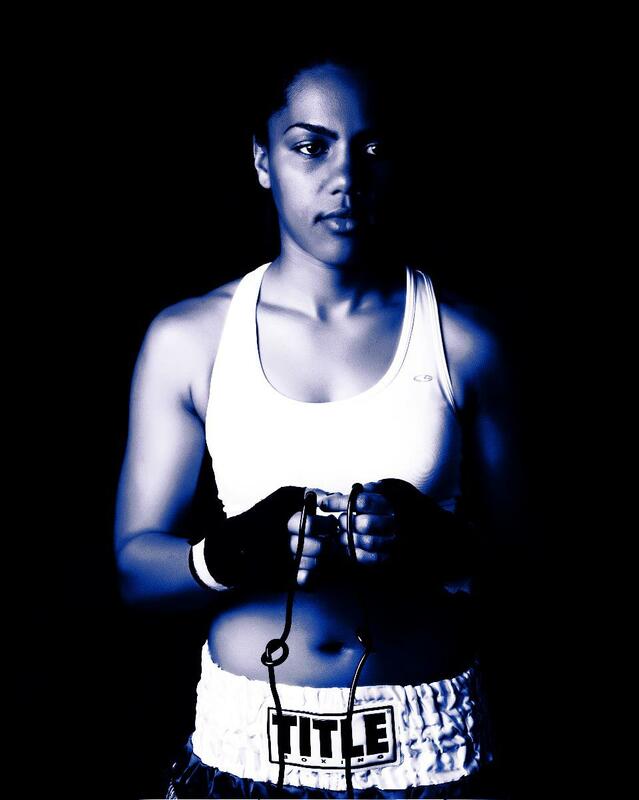 Kaliesha recently signed with HG Boxing. My question to you is, do you feel like maybe you’re being overlooked or does that inspire you even more knowing you got the better of West? AV: It does and it doesn’t. Sometimes I do feel like I’m being overlooked. Maybe it’s because of my record, it’s not 10-0 or 14-0, and it doesn’t look great. I think if you look at my record and who I have fought is what makes me, not the better fighter, I don’t think I’m better than her [Kaliesha] either, but it just shows what type of fighter I am going in, I’m not in there to be someone that gets beat up, I’m there to find out whose the better boxer. Kaliesha’s opportunity at catching a promoter is awesome she deserves it, we all deserve it. She got that chance and I feel it’s great. We are actually fighting on the same card in Mexico on the 29th so I’m actually excited to go out there with her. It’s great that Kaliesha has a promoter, I’m a little upset that I haven’t found one yet but if it’s gonna happen it’s gonna happen. I’m an exciting fighter so hopefully it catches on. EW: “You’ll be fighting Arely Mucino for the IBF Flyweight strap. Do you know much about her and what will you need to do to come away with that belt? AV: “She’s a good fighter with the typical come forward Mexican style and bully your opponent to make them quit or frustrate them. For me, I come from a structure of fighting alongside Mexicans so it’s not a problem. I think it’s gonne be, not easy, I don’t take anyone lightly but the coaches have got me doing the right thing and we’ve studied her. We’ve got the right thing going on and we fell we’ll come out victorious. The only thing is that I’m not going to win on points and I’m taking that into considerstion. EW: What would it mean to you to become a world champion? AV: It would mean a lot. The only time I won a championship was against Kaliesha [IFBA North American Bantamweight] and that was a big deal to me, she’s top notch. So winning this one will be even bigger and hopefully it opens more doors for me so I can get out there and fight more champions. I want to fight the best. EW: How does Ava Knight want to be remembered in boxing when it’s all said and done? AV: At the end of it all I just want to be the one who came up and did what a real fighter is supposed to do. I want to be the champ that never gives up so that the younger girls can say, ‘That’s how I want to be.’ I want to be known for my heart and the respect that I have for the game of boxing. Most importantly though, I want to be remembered as a positive role model. EW: Do you have a message for your fans in closing? AV: I just want people to go check out my website OfficialAvaKnight.com to see what I’m all about, don’t judge me by what you see. I just want people to know what women’s boxing is all about and I want to send a special thanks to all the people that have sponsored and supported me through out the years. Ava Knight is sponsored by MyImproveBalance.com. Improve Balance bands help improve strength, Energy, Disposition, Balance & Mood. These Balance Bands work simply by wearing them. There is no special gimmick or procedure to follow. Improve Balance contains a thin polyester film hologram which reacts differently for each person. Improve Balance hologram are 30% bigger than its competitors. Visit MyImproveBalance.com today and get Free Shipping on all your balance bands. Improve Balance the leader in “Balance Bands” Technology. Team Knight is hard away at camp. Ben Bautista has me working hard and he has a great game plan to get this fight going for me. Arely Mucino will be no push over, but she will have her work put out for her also. This is going to be a top knotch fight for the flyweight devision and I am still in need of some help. Our Team still needs some uniform for the fight and I still need help with training costs. Anyone who would like to help please let us know avaknight15@yahoo.com. Agknowlegement and other ways we can help compensate for help can negotiated. This will be a televised fight on Televisa and will have big press around it. I would love to see local and abroud business help out female boxing. I want to send a special thanks to all the people that have sponsored and supported me through out the years. With the local businesses in Chico California, I'll start with Dave Brown's Pest Control. He helped with getting me new gear, that still today is the newest gear I've had for over 8 years. I want to send a thank you to Fragoso Chiropractic. He did wonders for me and helping me recover for my back. I don't know if I'd be in the good standing I am at today if it weren't for his healing hands. I would recomend him to anyone and everyone in the Chico area. I want to send a special thanks to Nor Cal Strength and Conditioning. They helped train me before I had moved to the bay area and showed me special exercises that I use in my everyday training today. They are the best specialty gym in Chico and really is the best place to be to get in great shape and become the strongest person you'll ever be. In Oakland California I'd like to send a special thanks to Boxing for Health for all the great time I had working there and the great people I got to meet and train. I met a people there that will be a part of my life forever. Special thank you to Sean McDonough for the great photography he has done for me and all the support he has shown. He has become a great part of my team and shown a side of me that I've never even seen before. If your in the bay area, I recomend him to anyone who needs photgraphy done. I want to send a special thanks to SFC, Straight Foward Club in San Fransisco for taking me in and letting me become a part of their team. They are the best club in San Fransisco and they mean business. I've never walked into a gym before with so much boxing hunger. Everyone is nice, but everyone is focused. A real boxing gym, not a fitness gym. In Los Angeles, I would like to send a big thank you to Inraged Clothing. They sponsered my outfit and had me looking great for my last fight. A group of great people who make a great brand of clothing and did it all themselves. A big supporter of boxing and MMA alike. In Sacramento, I want to thank Improved Balance Bands for supporting me right now, helping compaign for myself and my new business. They are showing great support for me right now and help advertising my website. Two great guys, started a business and know how hard it is to start from scratch. Thank you all for helping me through my career and for those who would like to help please contact Ava Knight at Avaknight15@yahoo.com. There is always room for more on Team Knight. So I get comments from people all the time about my weight and the way I look. I've been told that I am too big for 112 but too small for 118. I here a lot about how champions won't fight me because I have no title and don't have enough fights, then the next minute I see they fought someone with double the losses than wins on their record. So, today, I've been getting calls and posting topics on Facebook. Mainly the topic of me as a fighter being avoided. I feel, today, with all the images fighters have come to try to hold up, respect from other fighters are the cost. When a fighter calls themself the best, they must have fought the best, so you would think, not the fighters past their prime, on there way out, fighters with losing records, and so on. I have always been the 'OPPONENT' and nothing more. I have never had my own promoter promote me as the home team, never had a home field advatage or even had a place where I can have my family come without travel. That has hindered my chances of making local fans and support. I have a list of fighters that I could call out, but that doesn't make anything happen. We need the fans to bring it to the attention of promoters to make big fights with females happen. No offence to the ladies that brought it up and made it big in their time, but bringing back a fight like Mia St. John Versus Christy Martin is pointless and being so out of age and past their primes may hurt us as females to televise a fight like that, when bigger fights like Knight and West could be happening locally and on your television. Food for thought...who do the people want to see me fight?? 110lbs to 118lbs? So, as a professional fighter and outstanding female boxer, I've decided to become a blogger. I know some people blog about anything and everything but I'll try to keep it as interesting as I can. I just want to become more personal with the fans and keep things up to date. I do everything on this website myself, so, why not do what I want right??! Well, I'll try this out tomorrow fresh with a brand new blog. Excited about this, since I have so much free time on my hand. Sorry about spelling, maybe I should write it in word first lol. Hey everyone! Letting all the followers and fans know what's going on with Team Knight. We are still training strong, staying in shape. I am getting over a horrible sickness that I've had for a few weeks, but I'm ready to get back in the gym and start training hard as can be. I'm waiting for the call to get any fight, because Team Knight fears no one. Also, for those of you in Chico California, Ava Knight has had the honor to start a boxing class with her former coach, Joe Rodriguez at In Motion Fitness. We run a hour and a half class Monday thru Thursday at 7:30 pm in the big room in the back. It is an intense cardio class with technique and the teaching of the basics of boxing. Hopefully, for those interested we will be able to start an advanced class for sparring and contact. One step at a time. It is now three days after the fight and I look back at it as one of the best fights I've ever been in. Kaliesha West is the best competition I've ever faced. We are going to look back at this fight and know, we both fought our heart out. The both of us both think we won, but a draw wasn't a loss for either of us or women's boxing. We came out and showed the world what two skilled females look like fighting each other. No mismatch, no easy win. After this fight, my feelings about boxing is I don't want to waste my time with underclass fighters. Though I feel I have not been mismatched my whole career, I want the best for my future. I want titles, I want champions, I want the best. I want the best at 112, the best at 115, and the best at 118. A rematch with Kaliesha will defenitely be created in the later future, but not for nothing. We are the Mayweather's, Pacquiao's, Marquez's of women's boxing, so why should we get anything less. We are the pick of the crop, the best of the best, and if people want a demand for a rematch, just like the men, they must make it worth it. USA's best, California's best, and we want nothing less. We want it to be fair, we want respect and our time to show the world what we are made of, not just the city of the venue. We are womens' boxing and we deserve better. A lot of people are quick to judge a fighter without knowledge of what is really going on. Looking at my record, I started quick, went up in competition fast, and then after a loss with the Mexican champ Ana Maria Torres, took a long “break.” I put it in quotes because it was not by choice. For the most part I took the break because of a back injury I was waiting to heal from, but when I was ready to fight again and start back up in the gym, my life started falling apart, literally. To start off, I was brought up as the “boy” in the family, getting my hair cut off every few years down to my scalp, and remembering people telling my parents they have a good looking son. Despite that, they put me in ballet, where I was told I was very good but didn’t have the financial means to continue. While that fell apart, I spent years of my childhood watching my mother work day and night to support the five of us and a family member with a habit. I had a rough time through school never finding a place to fit in; I was left most of the time at lunch time alone stuck in my own thoughts. I stayed to myself, and while people knew who I was, many put me in a place where I felt invisible. Now, I’m not saying that I have it worse than anyone; I actually have no ill feelings about my childhood because it made me who I am today and I know there are people out there who didn’t get the opportunities I did. Boxing became a part of my life as an accident. I had never seen a boxing match or even talked about it till I had stepped in the gym at age 13. My former coaches thought I’d never make it, I got in the ring one day and got knocked down for my first (and last) time, and while most may have walked away, I came back the next day. After 5 years of a great amateur record, and creating a name for myself in the amateur boxing world, it may have not been enough to have a 28-4 record because I was being compared and shadowed by groomed local female fighters (with worse records) who had money and promotion on their side. I believe all of us women go through the same things, we spar the guys cause it’s all we have, we work just as hard as men or more just to prove a point, and we fight with passion and will. My Pro career was great, I feel that I have no shame in what I have done in my career and that is including my loss. I have gained so much from all my experiences with every fighter that I’d never take it back. A lot of people don’t know how hard it really is for us though. While in the spotlight we see big fighters, particularly men who get paid a hundreds of thousands if not millions, have huge fan bases, get 24/7 exposure of their training and months advances on training, I have had promoters say to me “take it or leave it.” Many of my fights were taken last minute, with minimal training, and for little money, and the worst instance being out of the gym for a week sick, getting a call after missing school and flying to LA and getting a first round KO. After that, I said never again. I got lucky with that and I would never do it again, but I still found myself taking fights last minute, not because I get offered a lot of money, not even enough to say I can pay my bills with it, but because boxing to me is my world. I eat, breath, and live boxing. After boxing fell apart in the town I am from in 2009, it was heartbreaking and de-motivating to me just to do anything. I was missing more than a hobby, buy my passion for life. After facing a break up that crumbled my foundation and ruined every ounce of confidence I had, I decided I had to get back to the one thing that kept me going through the last 8 years. I moved to the city of Oakland with nothing but my car and clothes, found a place to live and started up back in a boxing gym that made me feel home again. Moving to a place with no friends, no money, and sometimes little food was all worth it for the experience and chance to get back in the ring. I was alive again and nothing felt better. I was fortunate to get the chance to spar with a fellow female boxer who some called “pound for pound” and came out with more confidence in myself than ever. Since I moved, I have had the chance to fight once on a Golden Boy Card and though it was short, all experiences come with growth. Now I am getting back in the ring with a champion who I beat once before. I can honestly say, I know this won’t be easy, it wasn’t easy the first time, but we fighters never take fights to lose, not even to draw. She is coming back to avenge her loss, and I have taken the point to be the opponent to take her title. I know the potential of both of us as fighters and the roads we took after our fight have been totally opposite. While Kaliesha stayed busy fighting all over the world and winning a world title, and as I previously stated, I was going through an inactive period. Many of you will be watching for the results of this fight and many may be rooting for my opponent, but this fight, no matter what the result, will be a big step up for women boxing. Being in the spotlight has never been my specialty, but this is my story and I want the people and fans to know who they are watching, rooting for, and eventually paying for paper view fights on TV. This is the Real Ava Knight…Thank you.